Select any image below to enlarge it. This genuine citrine crystal stands 4.5" tall x 3.1" x 2.7"
This polished citrine crystal has rare transparency with a very large gem-grade area inside. It has very fine natural orange-gold citrine color. This wonderful crystal is unheated and untreated. See a side view of this rare quality natural color citrine crystal. This genuine citrine crystal stands 5.5" tall x 3" x 1.9"
This polished citrine crystal has rare transparency with several large gem-grade areas inside. 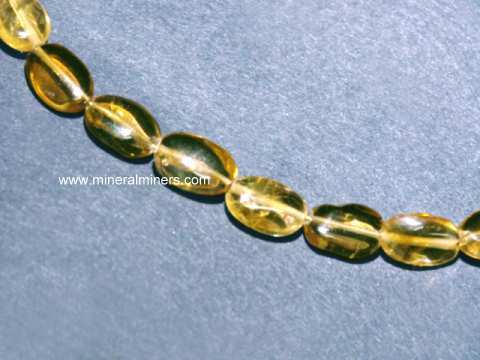 It has very fine natural golden-yellow citrine color. This wonderful crystal is unheated and untreated. See a side view of this rare quality natural color citrine crystal. This genuine citrine crystal stands 5.3" tall x 3.6" x 2.7"
This polished citrine crystal has very good transparency with natural golden yellow citrine color. This wonderful crystal is unheated and untreated. See a side view of this genuine natural color citrine crystal. This genuine citrine crystal stands 6" tall x 3.5" x 2.7"
This polished citrine crystal has very rare transparency with large gem-grade areas inside. 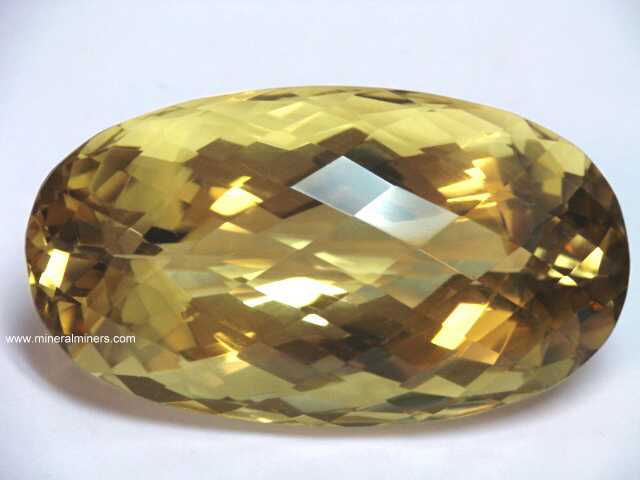 It has natural golden yellow citrine color with an amazing large internal rainbow reflection. This wonderful crystal is unheated and untreated. See an additional view of this genuine natural color citrine crystal. This genuine citrine crystal stands 6" tall x 4.3" x 3.4"
This polished citrine crystal has very good transparency with natural golden yellow citrine color. It also has a very colorful internal rainbow reflection. This wonderful crystal is unheated and untreated. See an additional view of this genuine natural color citrine crystal. Stands 9.9" tall x 4.7" x 3.3"
This large size polished citrine crystal has fine golden-yellow citrine natural color that is completely natural: this genuine citrine crystal is unheated and untreated. This is a very beautiful natural color citrine decorator crystal! It is transparent with some very beautiful internal crystal planes with amazing rainbow reflections! The transparency is consistent throughout the entire crystal. 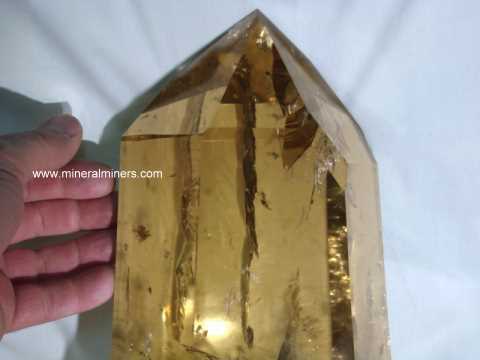 See also a front view of this large natural color citrine crystal. See also a different side view of this natural color elestial citrine decorator crystal. This large size citrine pendant is set with a natural color citrine gemstone with very beautiful light golden yellow natural color. 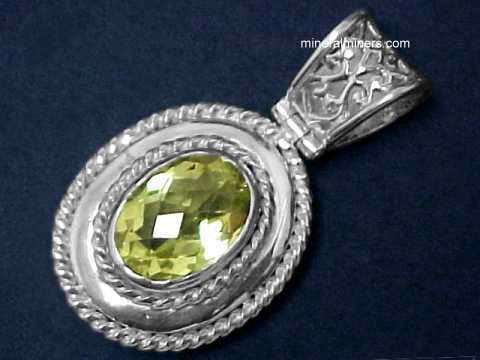 This genuine citrine jewelry pendant was handcrafted in 925 sterling silver and set with a 27x21mm checkerboard trillion cut citrine gem with a refractive index of 1.54 and weighing 41 carats! The beautiful citrine gem faces up eye clean, with very faint natural inclusions only visible under very close inspection with bright illumination. These very faint natural inclusions absolutely guarantee the natural origin of this large citrine gem. See also another view of this large citrine pendant. Natural Citrine Dimensions: 6" x 3.7" x 2"
This piece of natural elestial citrine is a partially terminated crystal with mostly broken surfaces and a few terminations. It is transparent with 100% natural light golden color inside - it is unheated and untreated. Natural Citrine Dimensions: 7.2" x 3.4" x 2.8"
This partially terminated crystal of natural citrine quartz has 100% natural pale golden-yellow color. It is unheated and untreated. This natural color citrine rough specimen has very good transparency with large gem grade areas inside that would yield over 1000 carats of flawless gems! It is also suitable as lapidary rough to make a single large carving of fine transparency. Natural color citrine rough weighs 9.1 pounds! Natural Citrine Dimensions: 9.5" x 5.7" x 4.5"
This partially terminated crystal section of natural citrine quartz has 100% natural light golden-yellow color - it is unheated and untreated. This natural color citrine rough specimen has very good transparency throughout with many large facet grade areas inside. 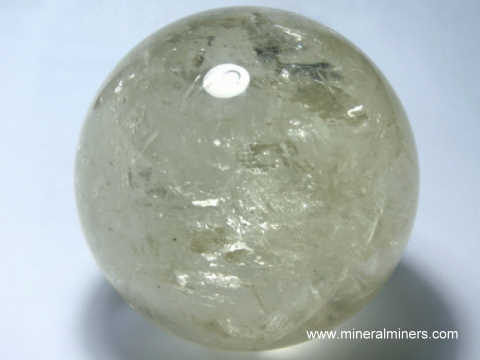 It is also suitable as lapidary rough to make a single large carving of fine transparency. See also a side view of this natural color citrine rough specimen. This genuine citrine crystal stands 5.8" tall x 4.7" x 3.7"
This polished citrine crystal has very good transparency with large gem-grade areas inside and very fine natural deep golden citrine color; it is unheated and untreated. See another front view of this fine natural golden color citrine decorator crystal. See also a side view of this natural color citrine decorator crystal. This beautiful decorator crystal also has some amazing rainbow color reflections inside; see another photo of this wonderful rainbow citrine crystal. This genuine elestial citrine crystal stands 11" tall x 6.3" x 4.7"
This polished quartz crystal has rare transparency with huge gem grade areas inside - it would yield over 2500 carats of flawless gemstones! This rare quality citrine crystal has fine natural golden citrine color; it is unheated and untreated. See also a full view of this natural color citrine decorator crystal. 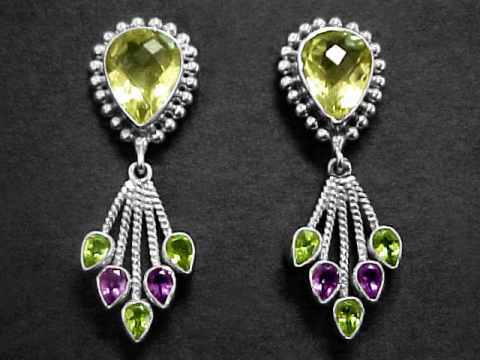 This beautiful amethyst with citrine jewelry design is set with fine quality gems of citrine and amethyst that were mined in Brazil. The 19x14mm faceted citrine gem has rich golden-orange color, and the 8x6mm oval faceted amethyst gemstone has lovely medium-dark purple color. This bright and colorful pendant was handcrafted in 925 sterling silver. Natural Citrine Dimensions: 4" x 2.7" x 2.4"
This quartz crystal specimen is naturally terminated. 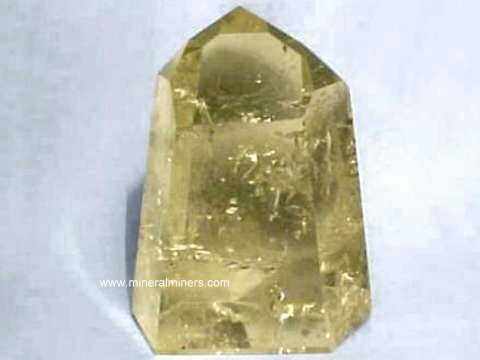 It has natural golden-yellow citrine color and very rare transparency. There is a large flawless area inside that would yield over 100 carats of natural color citrine gemstones! This citrine crystal is unheated and untreated. The terminations are in very good overall condition with only minor abrasions. See another view of this natural citrine mineral specimen. See also a back view of this natural color citrine specimen. Natural Citrine Dimensions: 6" x 3.8" x 3"
This elestial quartz crystal specimen is polished on the surfaces of one side as shown at left, and the other side is covered with naturally terminated surfaces. It was polished on one side to better show the wonderful natural golden citrine color inside! This elestial citrine crystal is unheated and untreated. 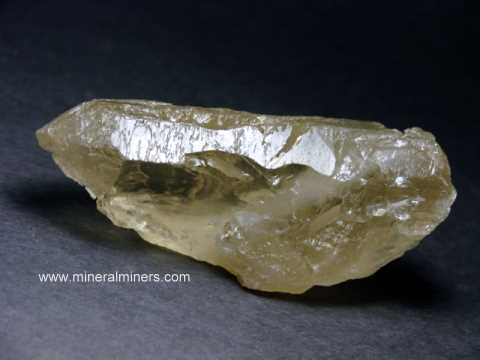 See a view showing the natural terminations on the opposite side of this elestial citrine crystal. This natural color citrine gemstone faces up eye clean (GIA: TYPE I Gem, Clarity Grade VS). This unheated gem has very rich medium-dark natural orange-brown smoky-citrine color. It has not been heated or treated in any way. This natural color smoky-citrine gem was very well faceted from natural color orange-brown quartz crystal rough that was mined in Brazil. This large size natural color citrine gemstone is eye clean (GIA: TYPE I Gem, Clarity Grade: VS). This unheated gem has natural deep golden-orange citrine color! It has not been heated or treated in any way. This natural color citrine gem was very well faceted from natural color golden-orange quartz crystal rough that was mined in Brazil. 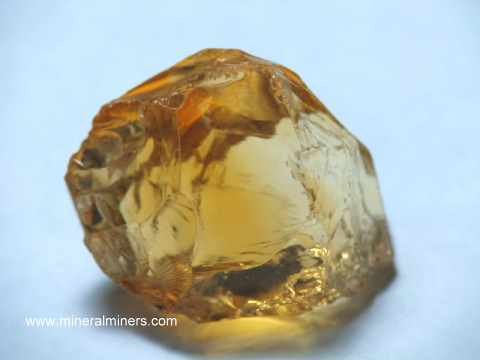 This natural color citrine gemstone is completely clean under magnification! 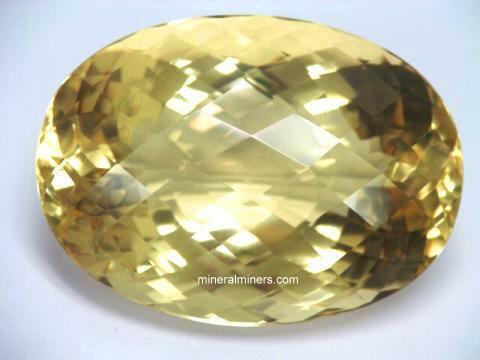 This unheated gem has beautiful light golden natural color! It has not been heated or treated in any way. This natural color citrine gem was very well cut from natural color golden quartz rough that was mined in Brazil. Natural Golden Citrine Gemstone, 465.40 carats! This natural color citrine gemstone is completely clean under 10x's magnification (GIA: TYPE I Gem, Clarity Grade: VVS+). This unheated gem has natural light to medium golden citrine color. It has not been heated or treated in any way. This natural color citrine gem was very well faceted from natural color golden brown quartz crystal rough that was mined in Brazil. This natural color citrine gemstone is completely clean under magnification (GIA: TYPE I Gem, Clarity Grade Flawless). This unheated gemstone has very fine natural golden-yellow citrine color. It has not been heated or treated in any way. This untreated citrine gemstone was very well faceted from natural color golden-yellow quartz crystal rough that was mined in Brazil. Extra Large fine golden-yellow citrine gemstone weighing 452.10 carats! This natural color citrine gemstone is completely clean even under magnification (GIA: TYPE I Gem, Clarity Grade Flawless). This unheated gemstone has fine natural golden-yellow citrine color. It has not been heated or treated in any way. This untreated citrine gemstone was very well faceted from natural color golden quartz crystal rough that was mined in Brazil. This giant size natural color citrine gemstone is completely clean under magnification (GIA: TYPE I Gem, Clarity Grade Flawless), and it measures 2.8 inches long! This unheated gemstone has very fine natural golden-yellow citrine color. It has not been heated or treated in any way. This untreated citrine gemstone is very well cut with good brilliance. See a side-view of this flawless extra large natural color citrine gemstone. 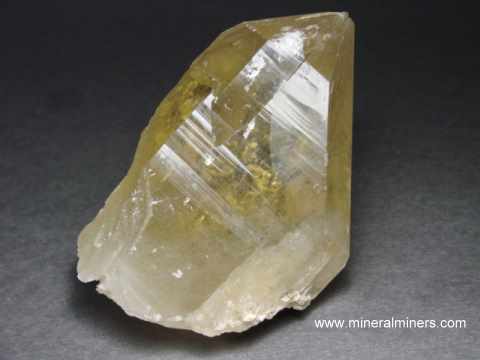 It was faceted from natural color golden-yellow quartz crystal rough that was mined in Brazil. Natural Fine Golden Citrine Gem, 763.75 carats! This giant size collector gem of natural color citrine is 3.3 inches long! 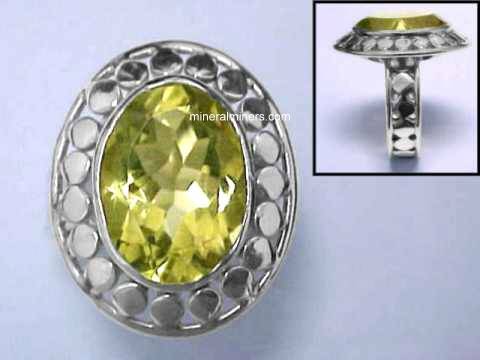 This unheated gemstone has very fine natural golden-yellow citrine color, and it is completetly eye clean (GIA: TYPE I Gem, Clarity Grade: VS). It has not been heated or treated in any way. This untreated citrine gemstone is very well cut with very good brilliance! See a side-view of this amazing extra large natural color citrine gemstone. 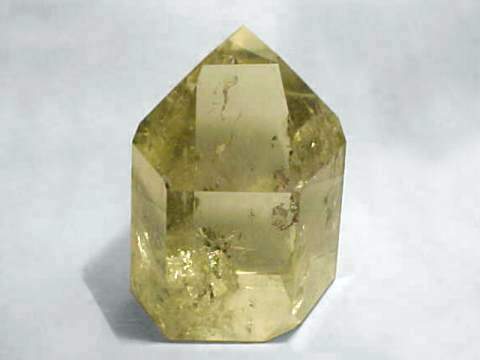 It was faceted from natural color golden-yellow quartz crystal rough that was mined in Brazil. 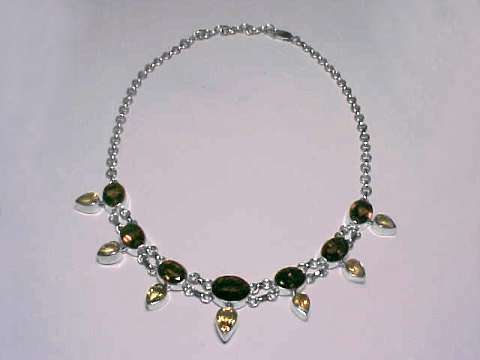 This beautiful necklace was handcrafted in 925 sterling silver and set with six oval faceted natural smoky quartz gems measuring 14x10mm and with one larger natural smoky quartz gem in the center measuring 16x12mm. This lovely smoky quartz necklace was also set with six 10x7mm faceted golden citrine gems and with one larger golden citrine gem in the center measuring 12x9mm. This handcrafted necklace has open back settings underneath each gemstone. See also a full view photo. This golden citrine bracelet has an adjustable length from 7" up to 8.25"
This beautiful faceted citrine bracelet was handcrafted in 925 sterling silver and set with seven fine quality golden citrine gemstones (51 carats total weight citrine gemstones). These wonderful citrine gems were very well faceted with checkerboard tops from rough that was mined in Brazil. They measure from 12x10mm up to 15x11mm in trillion cuts, ovals and cushion cuts. See also a full-view photo of this fine quality golden citrine jewelry design. Heavy Sterling Silver Bracelet with Citrine! This citrine bracelet has an adjustable length from 7" up to 8.25"
This heavy sterling silver bracelet was handcrafted in 925 sterling silver and set with a large golden yellow citrine gemstone. This beautiful citrine gem was faceted in an 18x13mm checkerboard oval cut weighing 15 carats! The close-up photo at left was taken under incandescent light, see also a full-view photo of this golden-yellow citrine jewelry design. See also a close-up photo of the handcrafted 925 sterling silver design in this wonderful citrine bracelet. Set with 64 carats total weight of lemon citrine gems! This lemon citrine bracelet has an adjustable length from 6.5" up to 8.0"
This large size faceted citrine bracelet was handcrafted in 925 sterling silver and set with seven fine quality lemon citrine gemstones (64 carats total weight citrine gemstones). These wonderful citrine gems were very well faceted with checkerboard tops from rough that was mined in Brazil. They each have a rectangular shape and measure from 14x12mm up to 17x13mm. See also a full-view photo of this fine quality lemon citrine jewelry design. This golden citrine bracelet has an adjustable length from 6.75" up to 8.0"
This beautiful faceted citrine bracelet was handcrafted in 925 sterling silver and set with nine fine quality golden citrine gemstones (54 carats total weight citrine gemstones!). These wonderful citrine gems were very well faceted with checkerboard tops from rough that was mined in Brazil. They are oval shaped and each measures 12x10mm. 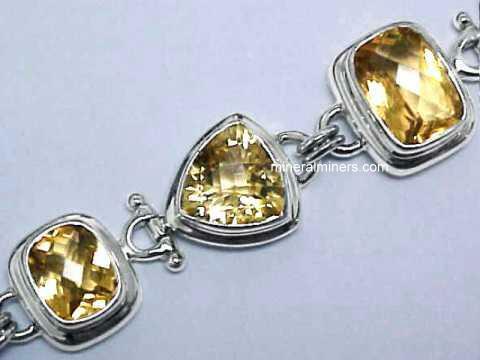 See also a full view of this fine quality 925 sterling silver citrine bracelet. Our collector quality Citrine items and citrine decorator specimens were all mined in Brazil! Here at mineralminers.com, we do not have any lab-created citrine, we only have real citrine that crystallized inside the earth. We have citrine rings available with golden citrine gemstones and also lemon citrine rings. See our selection of lemon citrine gemstones. 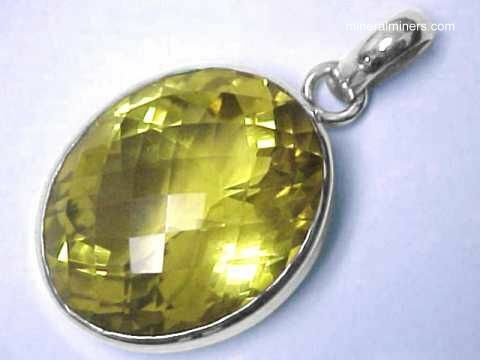 We also have a large variety of superior quality genuine citrine jewelry designs available in citrine rings, pendants, necklaces, earrings and bracelets. We even have some rare collector quality giant size natural color citrine pendants that are set with faceted gemstones of natural color citrine weighing over 100 carats! Many of our natural color citrine mineral specimens have gem grade areas inside, and they can also be used as facet grade rough. We have some very large citrine mineral specimens and crystals that are semi-transparent to transparent and could be used as lapidary rough for making large carvings, spheres and other lapidary items. Would you like us to inform you when we add more rare quality natural color citrine items on this page? We have a large inventory of genuine natural color citrine crystals, spheres, gems, and lapidary grade rough specimens in stock at our mineral warehouses, so be sure to let us know if you have any citrine special requests.